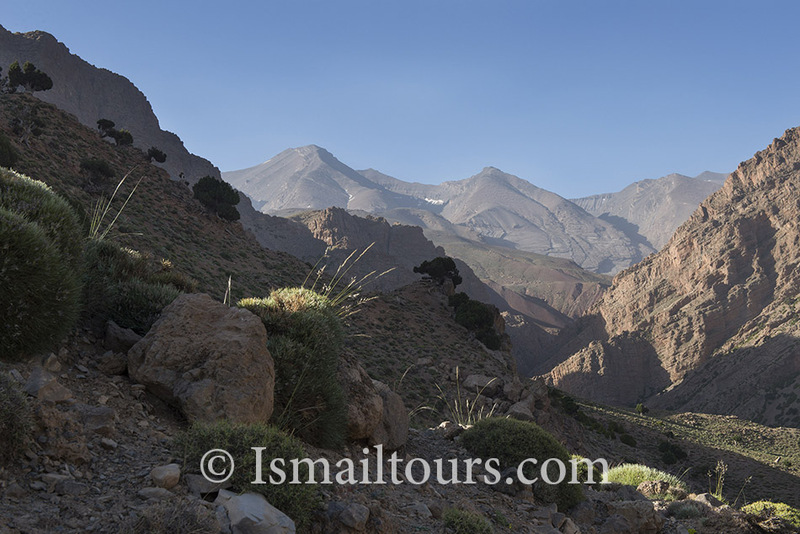 In this part of the high atlas region, which is the wildest part of the mountains, you will discover a variety of landscapes and rough nature. 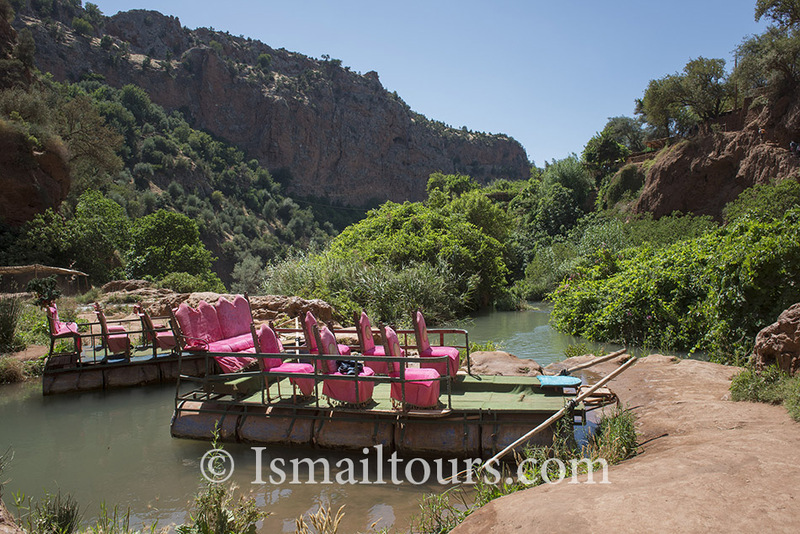 The Berber people have settled along the river in the valley of the roses and the ‘happy valley’. There is a stunning variety in landscapes from green and gentle to dry and wild. 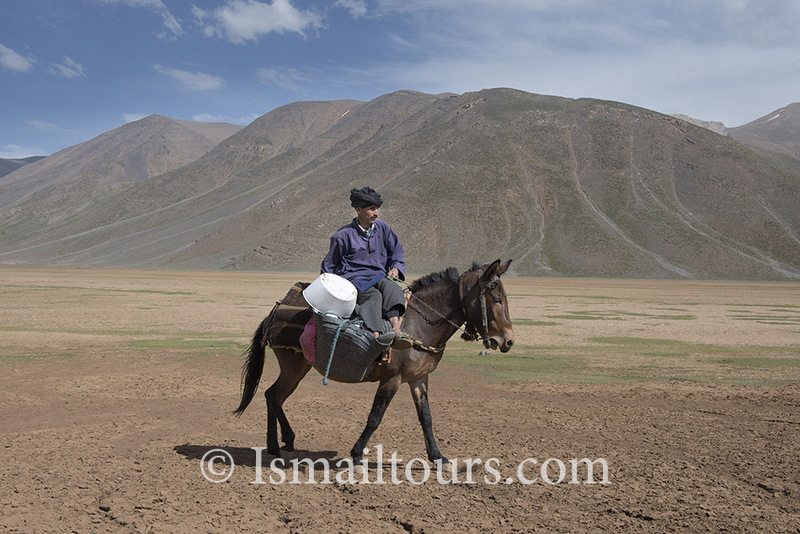 You will meet the nomads, and see how they live, walk through the valleys, the villages, cross the mountains and follow our road over narrow donkey trails. You will be, as are the inhabitants of the beautiful area, in perfect harmony with nature surrounding us. Travel with us and discover this special environment. Departure by international flight to Marrakesh. After arriving at the airport you are welcomed by our guide and brought to our accommodation. We will stay in a beautiful riad, which is located right in the old Medina. In the evening you will visit the Jemaa el Fna. This world-famous market transforms every night into an outdoor restaurant and all sort of things are sold and displayed. This ‘square of death’ , once offered a different kind of spectacle, in the form of public executions after which the heads of the victims were displayed on poles. You will spend the night in a riad, based on bed and breakfast. 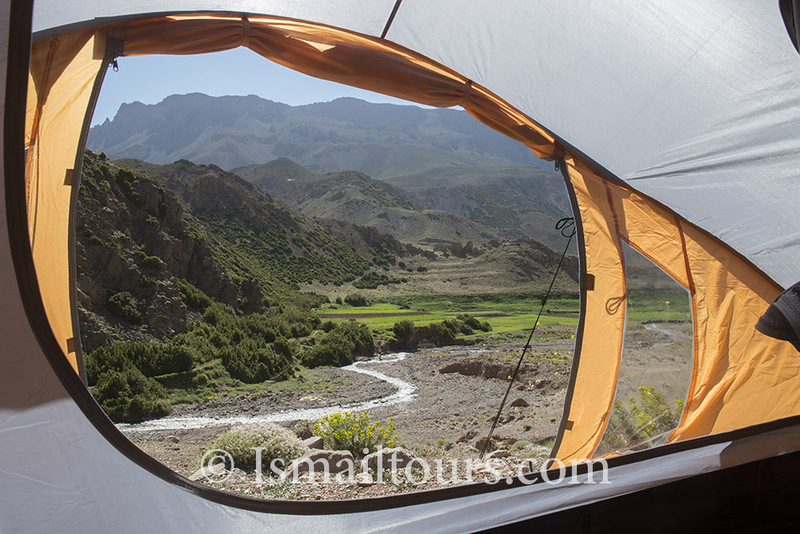 After breakfast we will travel to Azilal, the capital of the region. 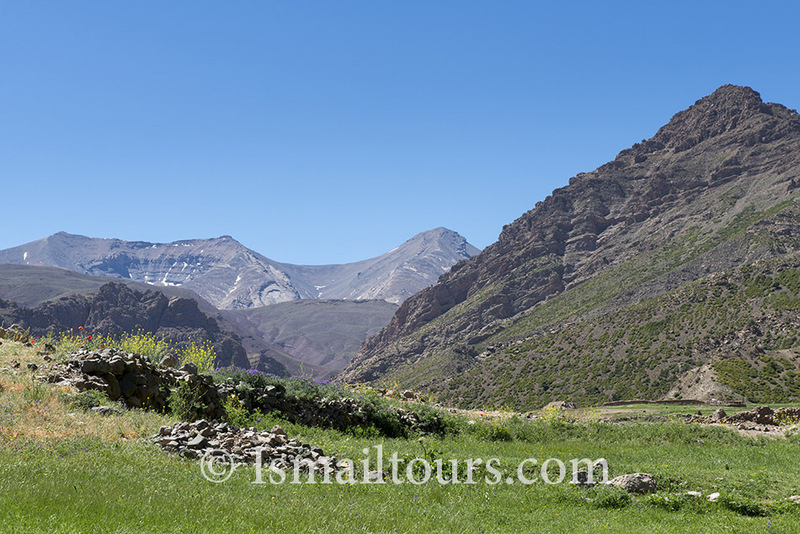 We’ll have lunch in a lcoal restaurant on our way and continue our trip to the mountain pass AGHBAR (2200 m). After a long, picturesque downhill trip we will reach Happy valley. Our adventure starts here. 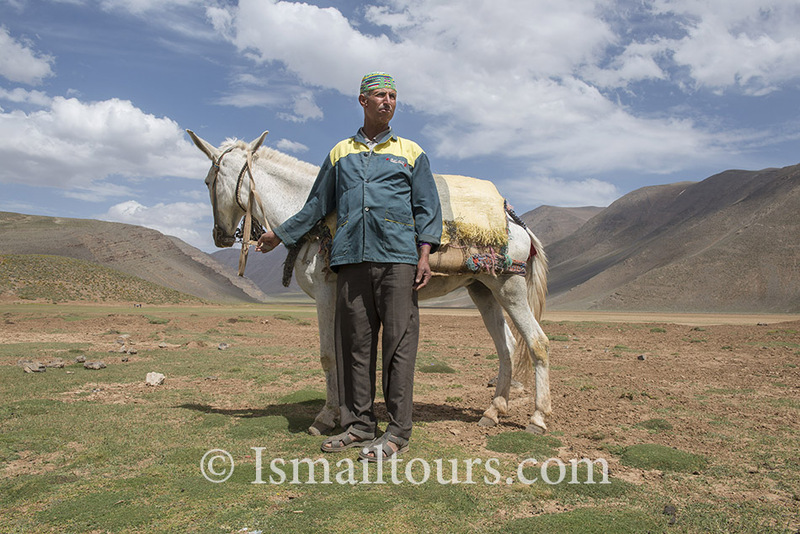 We meet our crew: the cook, the donkey drivers who are traveling with us and of course the pack-donkeys which will carry our luggage. 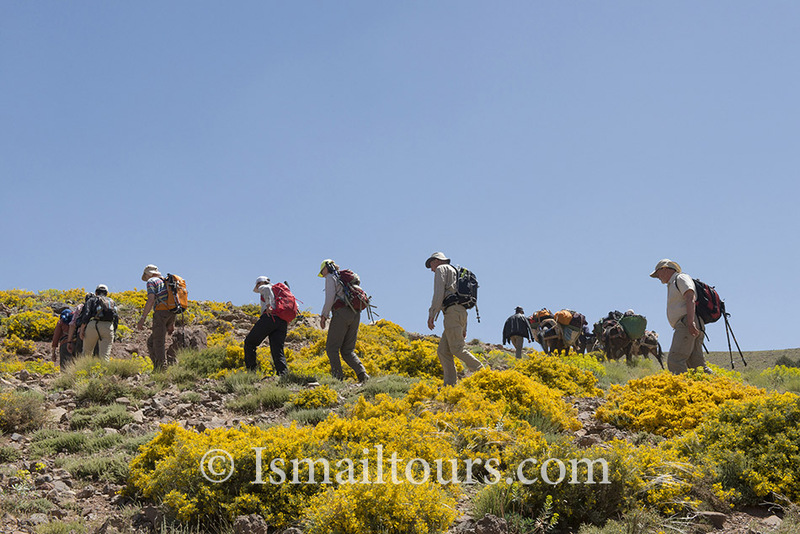 We will start our first walk, and after two hours we will reach our destination of the first day. We will spend the night at local accommodation (two hours walk). 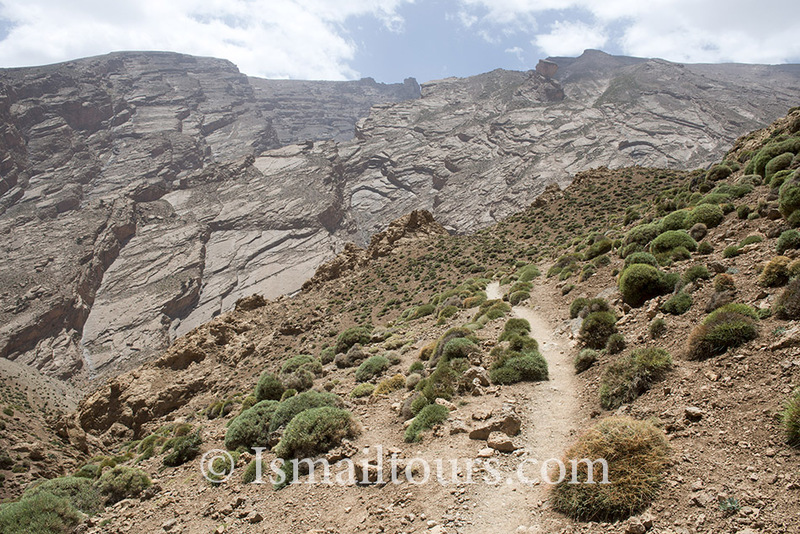 Day 3: Ikisse n’Arousse (2300 m) – Mountain Aghry (+3000m)- Tarkeddit(2900m). After breakfast we will journey up the mountain to the mountain pass of the M’goun. 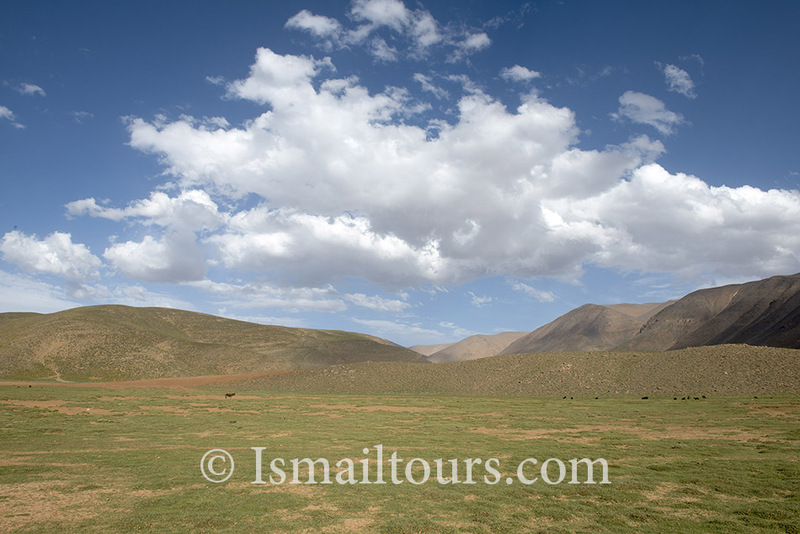 We will descend to the highland of Tilibit, where the sources of Tassaoute can be seen. Our walk ends at this beautiful highland where we will set up our encampment (4 to 5 hours walk). 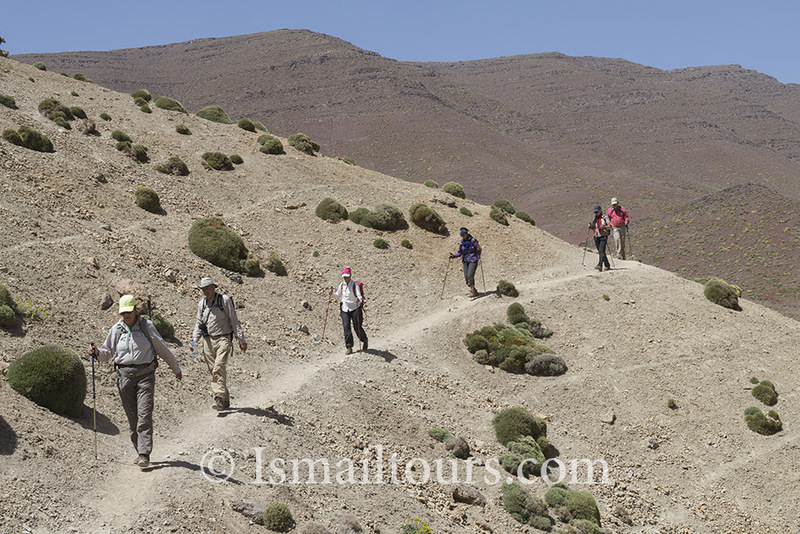 Day 4: Tarkeddit (2900)- Azgar top of the M’Goun-Assif Oulilimte. After breakfast we will leave our camp and continue into the mountains. The landscape is changes dramatically every half hour, the view is amazing. 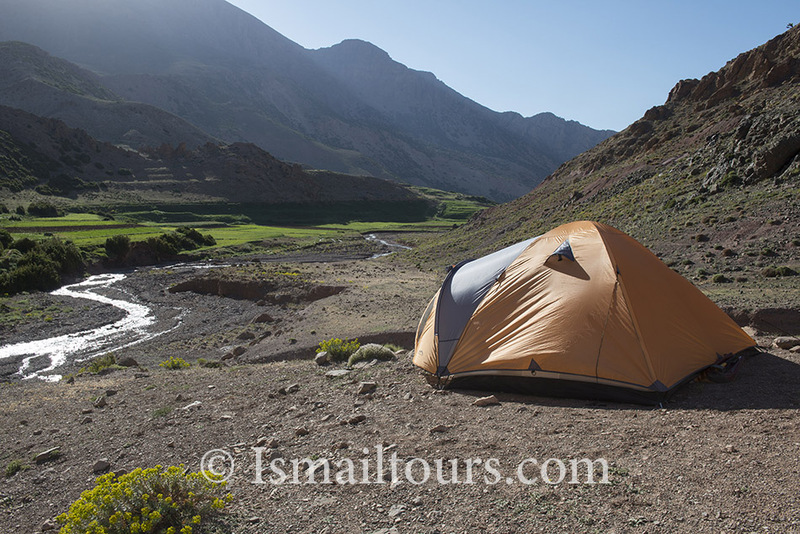 We will reach Assif n’Oulilimte and set up our encampment at a height of 2600 meter near the huge mountain M’goun ( 4071 m). 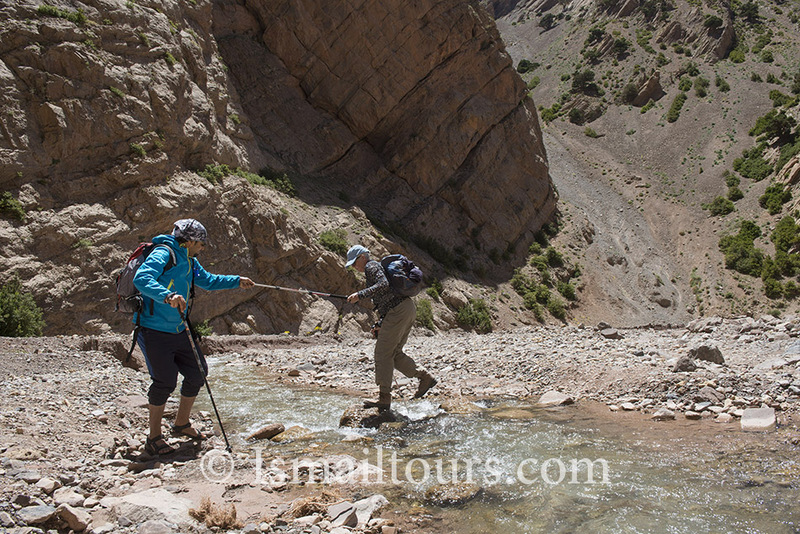 Experienced hikers can choose to climb the high mountain M’goun, another 9 hours walk. 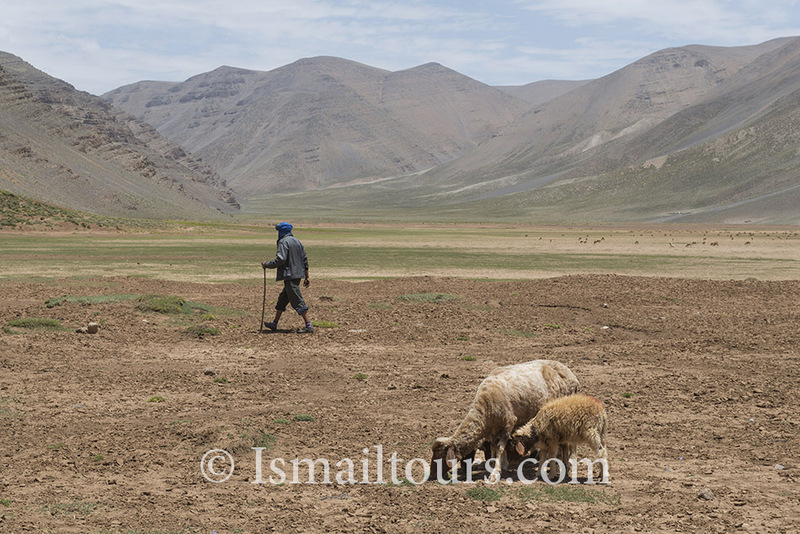 Day 5: Assif n’Oulilimte- Ain Aflafal. After breakfast we depart for a walk of approximately 5 hours. We will explore the extraordinary caves., which feature ancient drawings on the walls. Some nomads still live here. 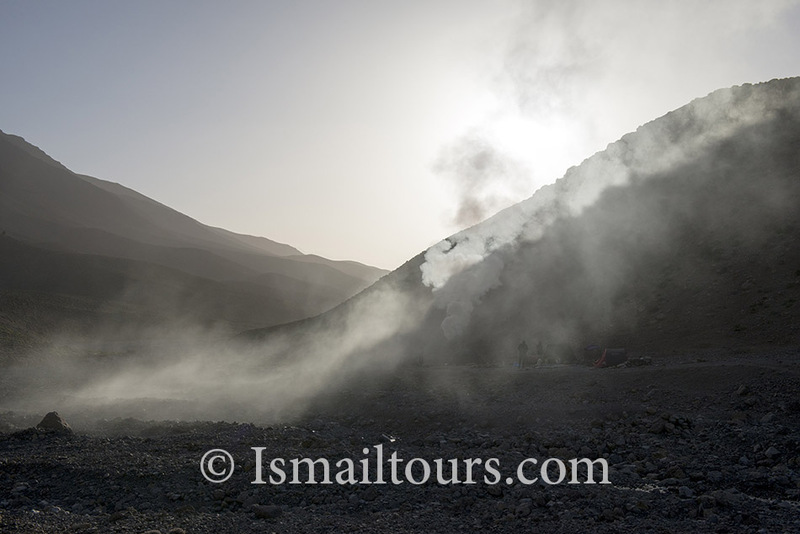 We will set up our encampment at the source Aflafal at a height of 2400 meter. 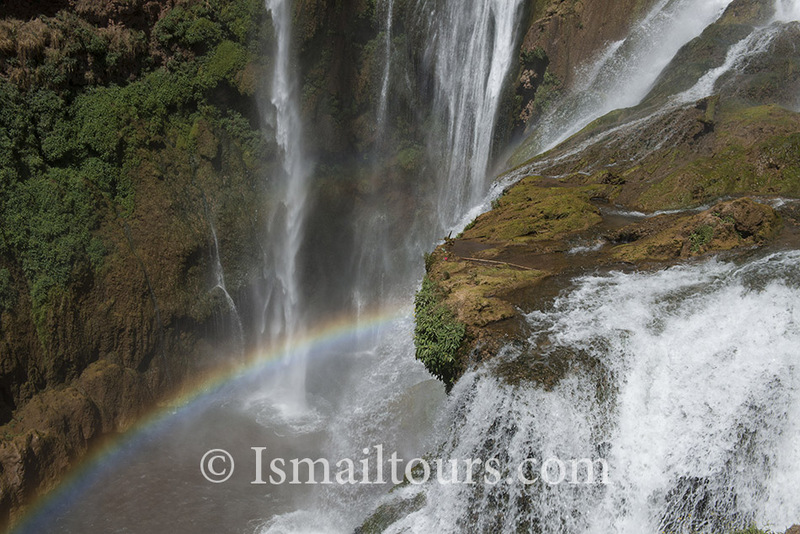 Day 6: Ain Aflafal- Valley of Ouzighimt-Imi n’Irkt. 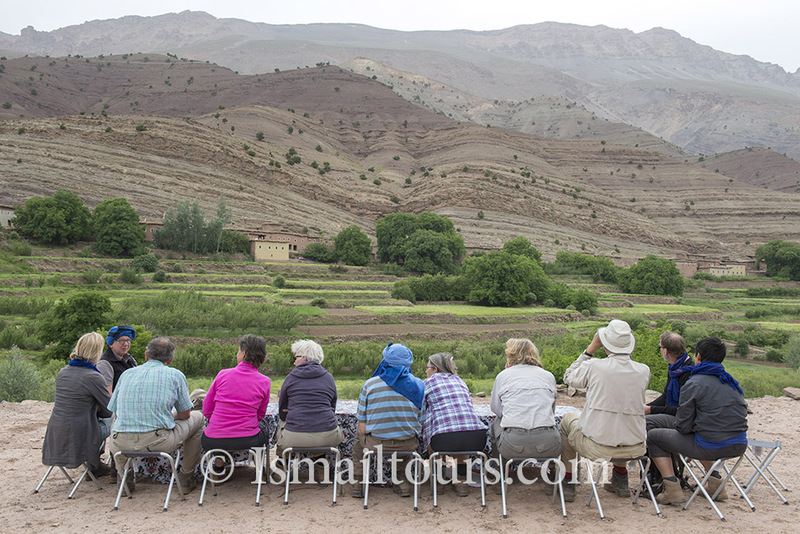 After breakfast we will leave to discover a beautiful valley amidst the mountains, the Ouzighimt valley. 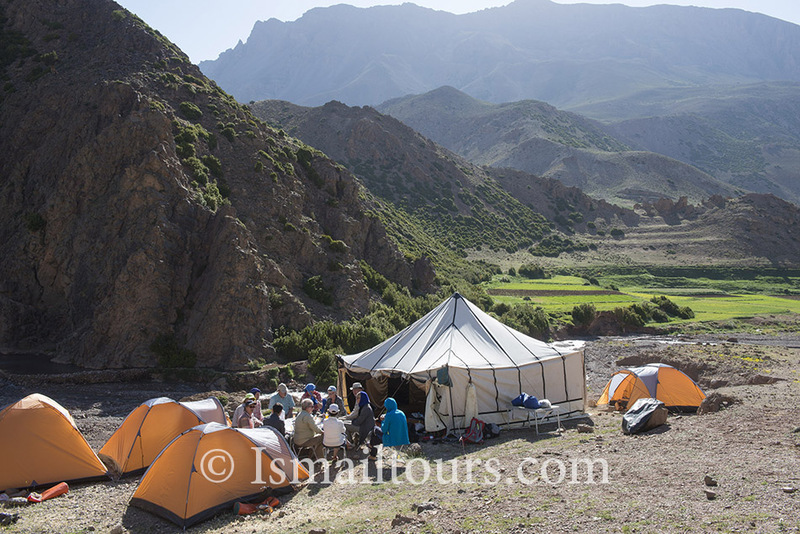 We will have a tasty picnic under a walnut tree, afterwards we will continue our trek and after another beautiful walk we will set up our encampment in Imi n’Irkt at a height of 2000 meter. 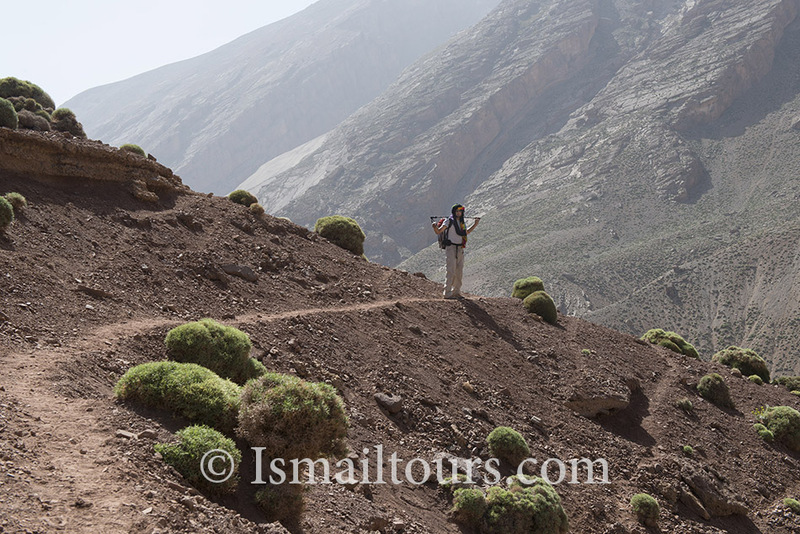 Day 7: Imi n’Irkt- gorge of the Achaabou- Aguerzeka. Day 7 is a ‘water day’. 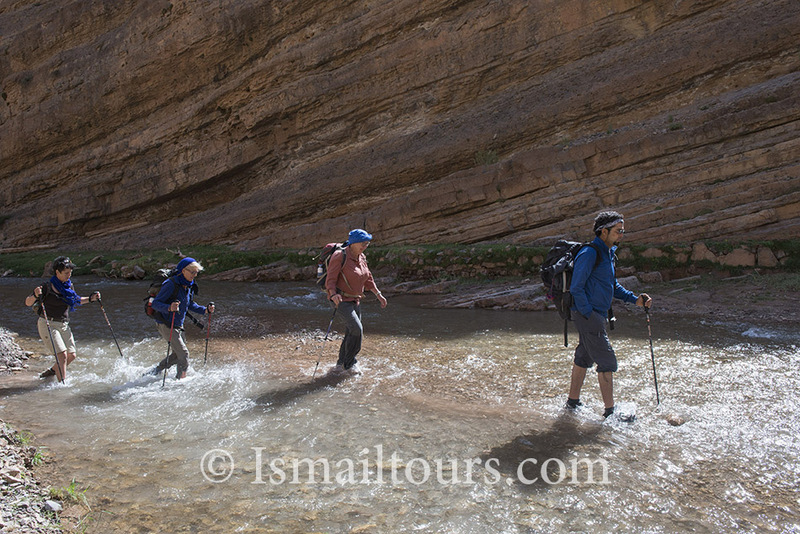 We will descend gorges and will wade through creeks. 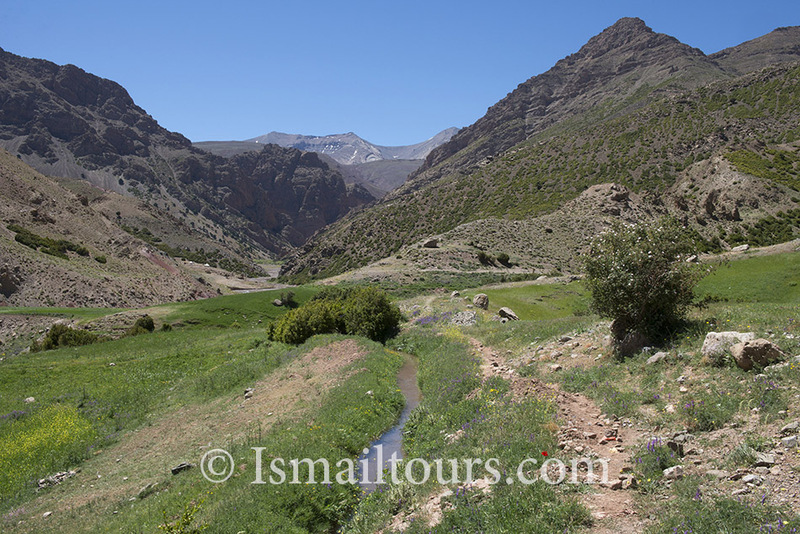 We will cross the well known gorges of the M’Goun (Achabou). The cliffs above our heads are over 1200 meters high and the water can be rather deep. We will follow the creek which will become narrower at the end and leave the gorges at the M’Goun. We will pass the village Tighanimine, where the valley will be a bit wider. 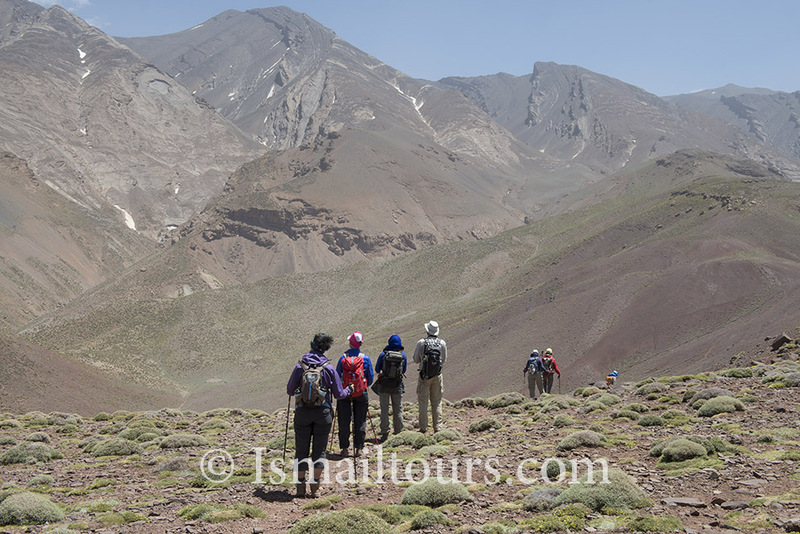 We’ll end our trek in Aguerzaka, where we will set our camp for the last time during our walking trip in this beautiful region. 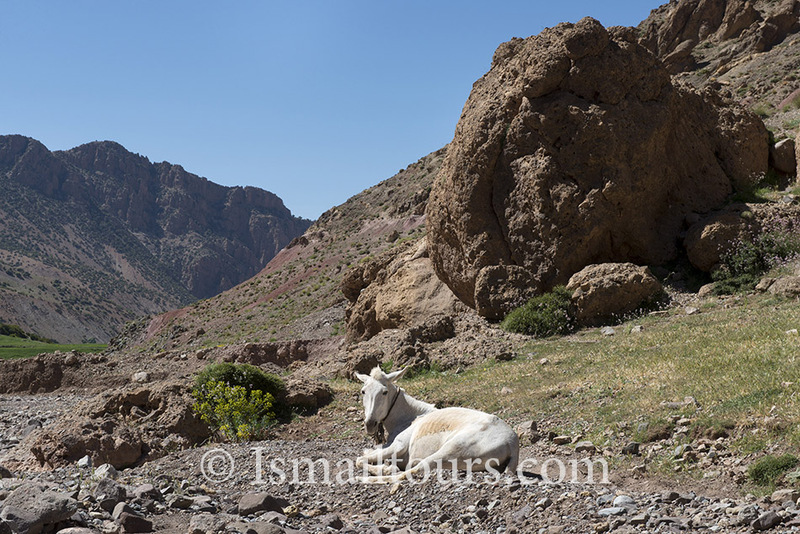 Day 8: Valley of the roses – Ouarzazate- Marrakesh. After breakfast we will drive through the valley of the roses. All over this region there are fields full of roses, from which a lot of rose products are produced. 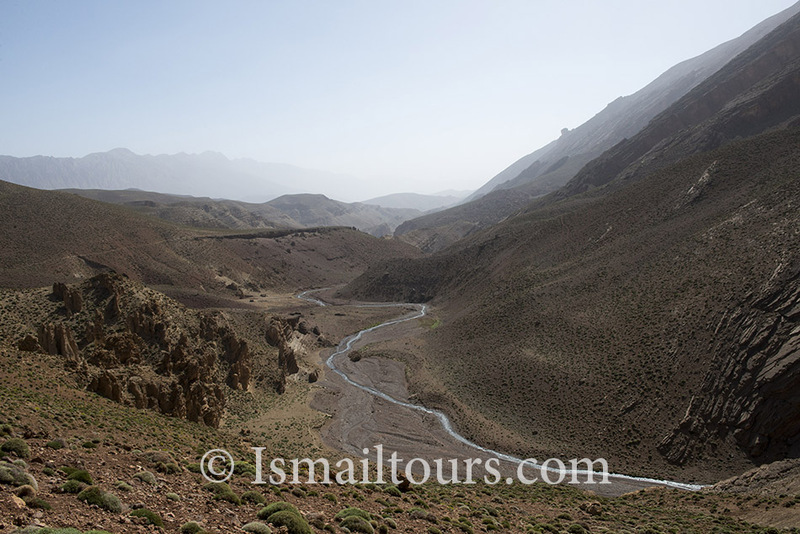 We will pass Quelaat Mgouna, the capital of this region and we’ll reach the oasis of Skoura, Ouarzazate. 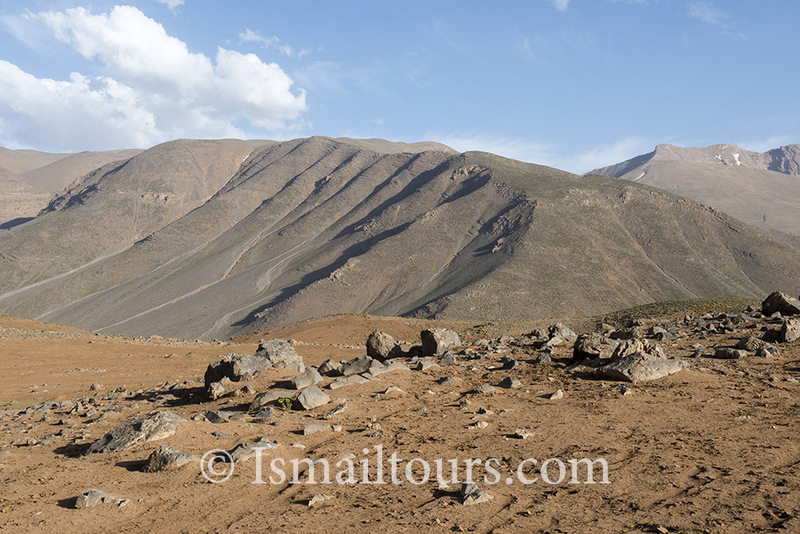 We pass the mountain pass of Tichka at 2260 meter high and arrive at an imposing panoramic view. We will descend slowly and reach our final destination, Marrakesh. Here we will spend the night in a local riad or hotel. You will be provided with the opportunity to explore this ‘red’ city from the eleventh century. The nickname refers to the many terracotta-colored buildings that appear red in the glow of the setting sun. There are many attractions such as the Museum of Marrakesh, the Koranic school, the Koutoubia Mosque, the Bahia and Badi Palace, the Gueliz district, featuring luxurious shopping opportunities and the tombs of the Saadiërs the Menara Gardens. A highlight is the garden of Majorelle, belonging to the fashion king Yves Saint Laurent. You should see the many souks (covered markets) and the Jemaa el Fna by day. Overnight: riad, based on bed and breakfast. We will accompany you to the airport of Marrakesh for your return flight. This concludes your amazing travel adventure in our beautiful country. Price per person, depends on the number of participants, please contact us for more information.